Men in multiple professions can take advantage of this Danner 22500 Men's Acadia Black Composite Toe Military Waterproof Boot. These uniform boots are designed to be highly protective in dangerous situations, which can be useful to military personnel and law enforc ... (see full details) (see specifications) #DNN22500. Men in multiple professions can take advantage of this Danner 22500 Men's Acadia Black Composite Toe Military Waterproof Boot. These uniform boots are designed to be highly protective in dangerous situations, which can be useful to military personnel and law enforcement officers who face danger every day on the job. The full-grain black leather and Cordura uppers on this footwear are lined with a Gore-Tex waterproof lining to keep your feet moisture-free, odor-free, and comfortable throughout the work day. In fact, we offer a one-year waterproof guarantee to make sure you stay dry. The composite toe and electrical hazard rating will protect you from the rugged and hazardous work environment you have come to expect. These Acadia boots meet or exceed the ASTM F2413-05 M I/75 C/75 EH standards. The stitchdown construction on these military shoes are high performance because you need the longest lasting footwear you can get. The Vibram 148 Kletterlift soles on these slip resistant boots provide lightweight comfort, maximum shock absorption as well as strong gripping power so that you will feel more comfortable and less tired. These soles are also non-marking, oil- and slip-resistant for addition traction. 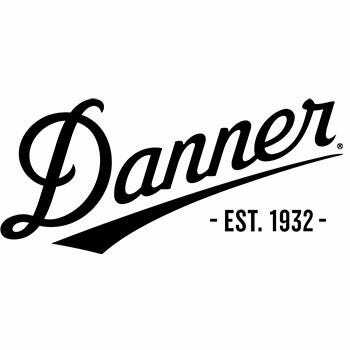 Not only will you be better protecting American citizens by doing your job efficiently and safely, but you will also be supporting American craftsmen with the Made in the USA Danner 22500 Men's Black Acadia Waterproof Composite Toe Military Boots. Nice boot for the money, I have been buying stuff from Working Person for 4 years and have always had great services. I was in charge of purchasing boots and uniforms for the men who are in security. Now, I didn't know what to do, but got on the Internet and Working Person popped up. I wrote that I needed help, got a phone call and I got excellent help on my entire order. Their staff sure does know their products. The guys have all commented on their uniforms and boots. All are pleased. They are very stiff out of the box and I have not worn them pending finding a lace-in zipper that works. I bought the Thorogood 10 eyelet to match the boot eyelet count. However, the Thorogood is way too short, so I ordered the Danner. I originally resisted getting the Danner zipper because it is pricey. When the replacement order comes in, I will start wearing the boots and may follow-up with a more complete review. I must add that WorkingPerson customer service is very good! Danner Boots: Men's Black Acadia 22500 Composite Toe Waterproof Military Boots is being added to your cart.